As we pursue a passion we may assume procrastination won’t be a problem. Unfortunately, working on a dream requires tremendous effort, and we fall victim to postponing the work we know we should be doing. We rob time from ourselves and wonder why we can’t get everything done. This week on The Portfolio Life, Rory Vaden and I talk about his latest book, Procrastinate on Purpose, and how changing our perspective of time management results in multiplying our time to do work that matters. Listen in as we discuss three dimensional thinking, the significance calculation, and how a “focus funnel” exponentially impacts our available time. Procrastination and productivity are strange bedfellows. Typically we think of procrastination as the antithesis of productivity. During our conversation, Rory shed fresh light on our misconception of time management and shared how to procrastinate on purpose. Everyone has the same 24 hours each day. It’s impossible to create more time within those 24 hours. From this viewpoint, our natural tendency is to cram as much work as possible into 24 hours so we can fall asleep feeling productive. We are slaves to the tyranny of the urgent (how soon something matters) and the important (how much something matters). 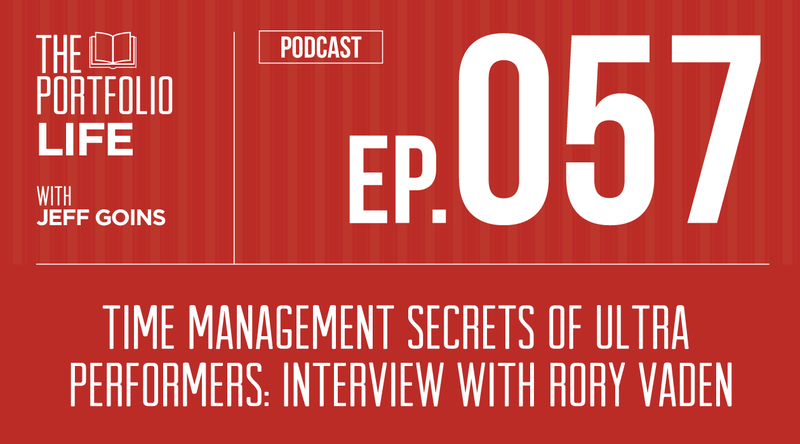 According to Rory, therein lies a secret of ultra performers. Instead of thinking of productivity within the limitations of a single day, ultra performers expand their construct to include value over time. They calculate the longevity, or significance, of a task to determine when and how it should be done. By pivoting our thinking to consider how long something matters, we can effectively identify how our activities today create more time tomorrow. Special announcement: Aug 28-30 — save the date. Something big is coming. That’s all I can say for now, but you’ll want to book your ticket to Nashville. More to come soon! Thank you, Jeff and Rory, for the fascinating “self-“management ideas. Lots of good stuff, but I can’t listen now. but it takes more time to listen than to read. Thanks. Great topic – great guest, great podcast – thanks Jeff. I have had 5 employees in my small business and I’ve had none (beyond myself). I presently have one. Without sounding whiny, and I know Rory agrees, it’s so much easier on paper than it is in real life. When I had 5 employees – I could occasionally slip away for a round of golf, but the high-wire act of keeping business pouring in was too much for me. At the end of the day – those people never replaced me – all the clients still wanted me. Maybe it was a leadership issue. Maybe it was self sabotage. Now that I have one – the balance is pretty decent, but my revenues are still way below where they were a decade ago. I honestly don’t know where the answer is – but after searching 28 years for the sweet spot – I conclude it’s harder than it looks to find balance. Do I need this book? Probably – but then there’s the time factor to read it. Hah! Life can be so complex at times. I’ve simplified mine down 1/a home where I have big windows and fresh air can flow through it, plus muusic and books and friends – and a computer for learning and communication. Right now, some of those items are missing. I hope to change that. God bless you as you find your “sweet spot.”! thanks Voni for the reply and encouragement! Finding maybe a new purpose does the seem to be the journey I have moved into in the past 3 years which has been challenging. Before it was providing for family/children – now – ….. still searching. Thanks again. whenever I think of you, I’ll say a prayer for your guidance. ok? I finally took the time to listen to this. Desperationg drove me to it. I prefer reading to listening. But tonight, it hit me. I’m writing, working on my blog. I want to spend time on the Work of Art FB as well as intentional blogging FB. Reading, learning, and encouraging. I am now going to restructure. What is the most significant? I recognized myself in many of the situations you two talked about. I will be gleaning as much as I can here… The funnel is excellent! To resist procrastination – it’s a slogan of my life! How to resist procrastination when you’ve got an essay deadline? https://writessay.net/ knows best! I just LOVED this one! Some really fantastic, concise concepts that I can apply right now. I am sharing this with moms on my facebook page too, because we need to remember that it SHOULD take 30x as long to teach someone else to do something as it does for us to do it ourselves (maybe longer with a child!). Also the 80% rule applies here. Awesome stuff! This was simply pursuing the whole www down precisely this sort of data. I thank you for your post this hobby has an end starting at this point. You shaped the post in a significantly intensive manner. So I express critical thankfulness and add your site to my top picks now. Appreciate the day. paper writing service – here you can order an essay for university! Hi everyone, here is the great site for those who need help in essay writing! Wow.This post seems weird Yoob Games! Paykasa kullanıcılarının vazgeçilmez sitelerinden biri olan https://www.ukashkartsatis.net/paykasa adresini sürekli ziyaret edip ürünleri satın alan kaliteli hizmetlerden yararlanmanızı tavsiye ederim. Paykasa bir cümleyle özetlenecek olursa ; Ön ödemeli kart sistemidir. Paykasa şu şekilde çalışmaktadır : İlk olarak https://www.paykasatr.net internet sitemiz üzerinden bizimle online iletişime geçerek, almak istediğiniz paykasa miktarını bize bildiriyorsunuz. Ödeme yaptıktan sonra size 16 haneli paykasa pin numaranızı gönderiyoruz. Bu pin numaranızı paykasa geçen sitelerde kredi kartı gibi kullanabiliyorsunuz. Paykasa’ın Kullanımı çok kolay ve yaygındır. PayKasa Kart Hakkında Genel Bilgiler Paykasa kart bozdurma işlemi çok kısa bir işlem olmasının yansına çokta dikkat edilmesi gereken bir konu olduğunu sizlere belirtmek isterim.Paykasa kart bozdurma işlemi sizlere alışverişlerinizden geriye kalan PayKasa kuponlarınızı güvenli bir şekilde bozdurma şansı sunmaktadır.Bu özellik ile alışverişlerinizde hiç bir kayıp olmadan güvenli bir şekilde alışveriş yapabilirsiniz.